New from Hudson Shuffleboards, the Torino Limited Shuffleboard features a contemporary look with classic lines. Constructed entirely of Solid Maple (no veneers), this newest addition to our collection is sure to be the centerpiece in any room. This classic, yet modern design features elegant legs, brass nail heads, and a top rail wrapped with your choice of genuine leather. This table is made to order and a can be finished in Matte Black, Espresso, Provincial, Honey Oak, Rich Walnut, Fruitwood, Mahogany, Cherry, or Natural Finish Stains. Or we can also match any custom stain you provide. The playing surface is constructed of select kiln-dried Hard Rock Maple and topped with our Polymer Finish (lifetime warranty). This is the same finish insisted upon by the Professionals in tournament play. And to help keep the playing surface true, climatic adjusters are included. Also Included is One Set of Eight Playing Weights, 2 Bottles of Speed Powders, 5 Inch Adjustable Leg Levelers, and One Board Wipe. 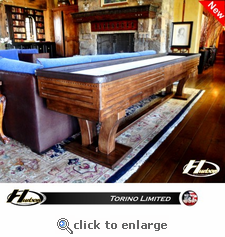 Join the Pros and Enjoy Playing Shuffleboard on a Beautifully Designed Torino Limited Shuffleboard. Available Sizes are 9', 12', 14', 16', 18', 20', or 22' (tournament size).